This is the motorcycle formula India has always needed! A simple, affordable adventure tourer that can take you almost anywhere in comfort. 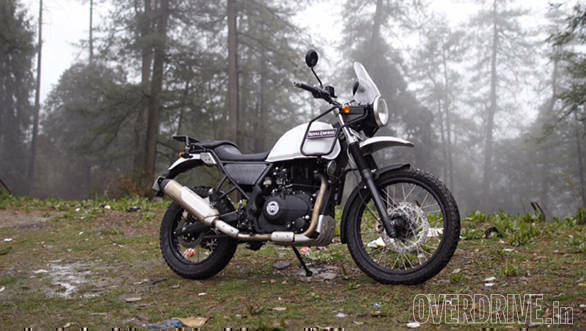 The Royal Enfield Himalayan, simply put, is the bike a lot of people have been waiting for, even riders who would normally never associate with the brand. The RE Himalayan is easily one of the biggest and most eagerly anticipated motorcycle launches of 2016. Royal Enfield is ensuring we ride the bike in the most fitting environment and have brought us to Shimla where the weather is snowy and biting cold. We're going to experience the bike over two days on a series of riding routes curated by Vijay Parmar of the Raid de Himalaya himself. Basically the very environment the bike was created for. So let's get to it! Call it what you will but the Royal Enfield Himalayan is easily the most purposeful looking motorcycle to ever come out of India. Many wished for more design flair but I actually really like the way the Himalayan looks. It's lean, no nonsense and you know exactly what it was designed for with just one look. There's literally just a headlamp, fuel tank, fenders (three) and wheels surrounding that brand new engine. Is it classically good looking? Not really, and I will concede that the high set headlamp and strangely shaped 16-litre fuel tank looks a little quirky. But the fact that form follows function and the simple, yet clean approach to the Himalayan's design massively appeals to me. It's a bike that you immediately want to ride the moment you set eyes in it. 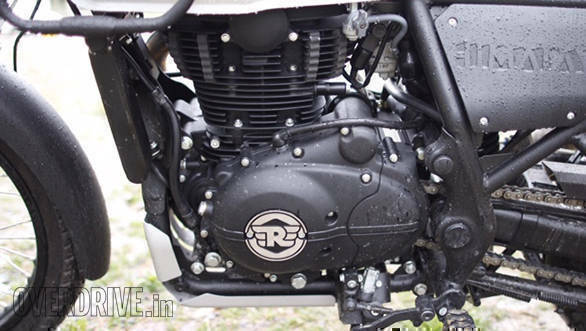 The details on the Royal Enfield Himalayan are fairly good. The black chassis seems well finished but there are a couple of rough looking edges like on the end of the fuel tank or the suspension triple tree. Royal Enfield tells us that these are still in the last stages of pre-production and that the bikes that go on sale will have better finish. The instrument cluster is unusual but has a timeless design although it isn't the easiest to read on the go. There's also a lot of information including two trips with average speed, a clock, digital compass, thermometer, gear indicator.There's also a button to turn on the hazard lights but it's a small button on the cluster that isn't effortless to access. 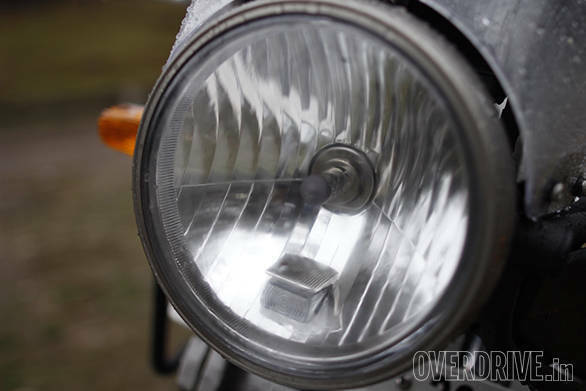 The headlamp runs a powerful 12V 60/55 W bulb while the slim tail gets an LED lamp. There's no 12V power outlet or USB port on board, which would have been a welcome feature on a motorcycle like this but that's a easy addition with plenty of solutions available. The rubber mounts on the footpegs are removable to expose steel toothed pegs beneath. But I never considered it because the rubber itself is very grippy, even with wet and muddy boots. The riding position is welcoming. On the main stand the Royal Enfield Himalayan looks intimidatingly tall but the actual seat height is just 800mm which is identical to a KTM 390 Duke. 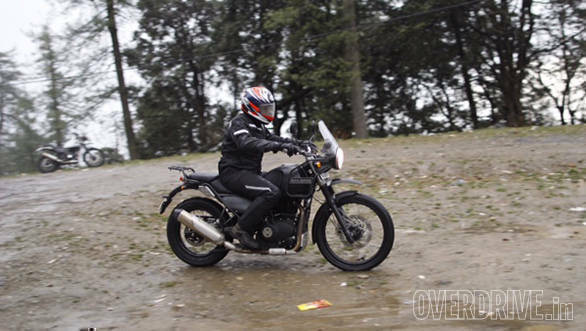 The Royal Enfield Himalayan feels slim between the legs and the wide handlebars give good leverage. The fuel tank has recesses built into the metal work . While they will fit most riders, I found my knees coming in contact with them but if you're less than six feet tall this should not be a problem. Standing on the pegs feels quite natural but the tank surface is quite slippery, something that can be easily remedied with Stompgrips. It's been a cold and wet ride all day and we even hit some snowfall around Shimla. We weren't able to go fast enough to experience the high speed wind protection from the tall windscreen but it was definitely effective at deflecting some of the chilly wind off our chests. The screen is clear and vision through it is good. Another nice point is that when standing on the pegs you have a clear view of the front wheel which is a confidence booster in the dirt. The LS 410 is a brand new engine, with LS standing for long stroke - 78mm bore and 86mm stroke. It's built from scratch but the LS 410 is no high tech unit compared with some of the stuff available on the market. The single cylinder engine is still air-cooled, but benefits from a small oil cooler that we're told keeps the temperature stable under hard running. The engine runs a relaxed 9.5:1 compression ratio and uses a simple two valve, SOHC head, a decision that was taken to boost bottom end performance. Fuelling is provided by a carburettor that has been jetted to perform from sea level to 12,000 feet. 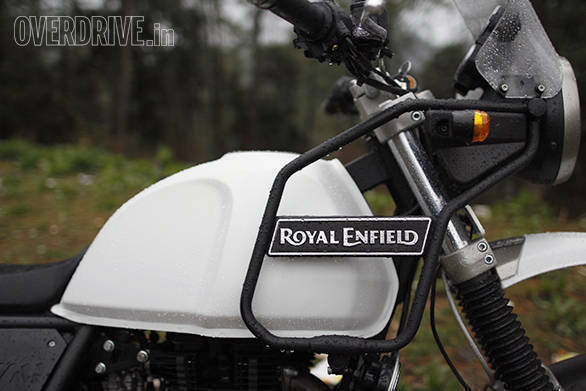 Royal Enfield tells us that high altitude performance will drop but not to the point of affecting the ride. Fuel injection is being considered for the future. There will be the argument that these design philosophies are keeping within the brand's heritage but let's not forget, they also help keep costs down. Perhaps more important is the fact that this engine uses a counterbalancer and is finally rubber mounted, both help reduce vibrations significantly. Within the first few miles it's clear that this is the smoothest engine to ever come out of Royal Enfield. Of course, there are some minor vibes but they don't got in the way of riding. Interestingly, the Himalayan is only available with an electric start. Having toured significantly on a variety of machines, I'm convinced that 25 horsepower is a good starting point to cover long distances in India at decent pace. The LS 410 comes very close with 24.5PS produced at 6,500rpm. But naturally, being a Royal Enfield the riding experience is going the be all about the torque that comes with the thump. 32Nm is a very generous amount and it's just 3Nm less than the frenetic 372.3cc motor from KTM produces. However, in the Himalayan, torque peaks from a low 4,000-4,500rpm which is 3,250rpm lower than in the KTM. Royal Enfield says that given the amount of low end torque, 6-speed gearbox simply wasn't needed so this bike sticks with a 5-speed. 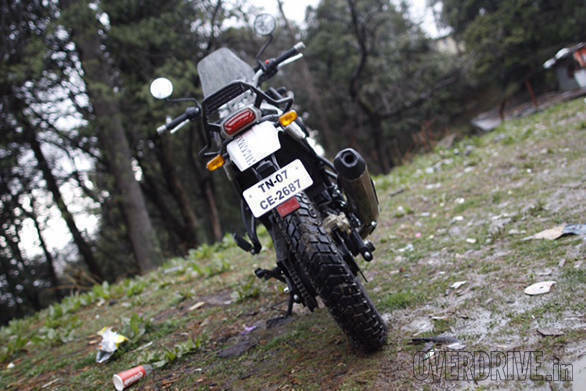 The way the Royal Enfield Himalayan performs is quite impressive. The engine has plenty of low end pull although there is a slight surge at the bottom as the power comes on around 2,000rpm. The gearbox is a little notchy between first and second gear and I also experienced quite a few false neutrals through the day, particularly when shifting between first and second gears. Second gear onwards the gearbox shifts well and even responds to clutchless up shifts without much complaint. Performance is decent and the Himalayan doesn't ever feel slow but it won't blow your socks off either. We didn't get to go beyond third gear for much of the day so more will only be revealed in the full road test. 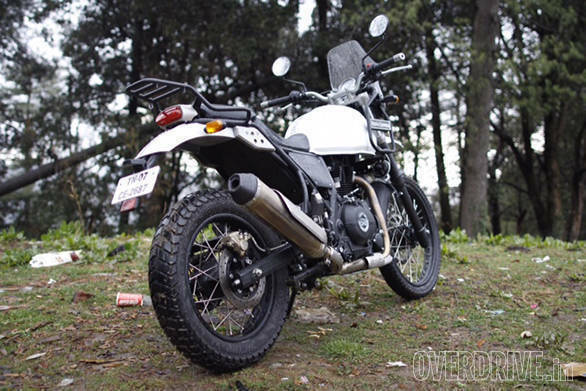 For now it's clear that the Himalayan offers unhurried, unstressed performance. Basically just what you'd expect from a Royal Enfield. The earlier mentioned snow, fog and wet roads haven't allowed us to explore the performance as much as we'd have liked. But on on these winding and broken roads the Himalayan chassis displays plenty of confidence. It feels a bit firm through small bumps but gives good feedback of what's happening below the big 21-inch front and 17-inch rear wheels. Larger potholes and craters are absorbed well. We spent most of our day in rough and broken tarmac where the Himalayan impressed with its composure and never snapped back in an unpredictable manner. I was a bit apprehensive of the blocky Ceat Gripp tyres but they surprisingly good traction whether on dirt or tarmac. A two piston Bybre calliper bites on a 300mm disc up front and it has been set up to be easy to use on dirt. There isn't very much bite at the lever but a firm pull will slow the Himalayan down without drama. The rear disc brake is effective and it is easy to lock up the rear wheel and get the bike sideways in the dirt. Maneuverability is very good. You sit high up and the turning radius is quite tight. Clutch action is light and friendly as well. 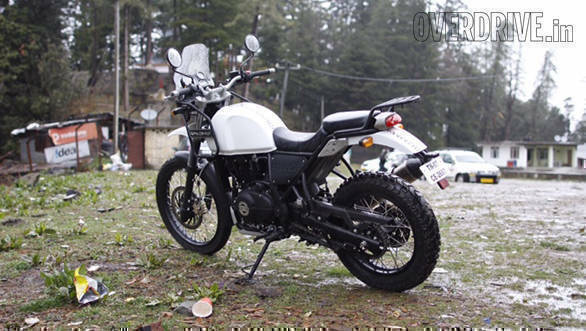 I can see the Royal Enfield Himalayan being a great bike to commute on in daily traffic. Our time with the Himalayan in and around Shimla shows that it can handle the terrain it was named after well. All that torture testing in this environment has resulted in a bike that feels tough. The relative lack of vibration means things falling off the bike shouldn't be an issue either. The Himalayan is a commendable effort by Royal Enfield, a moment of pride and one of the best motorcycles to have come out of India to date. Given the basic spec sheet, we expect this bike will be priced very competitively indeed when it launches on March 16, 2016. For the full picture, including performance, efficiency, highway manners and more, stay tuned for the our road test.